I believe this photo of the old Felton Post Office was taken circa 1930’s and was next door to the original Roy’s market, which was across the street from the later Roy’s before New Leaf took over. Old Felton Post office, circa 1930’s. 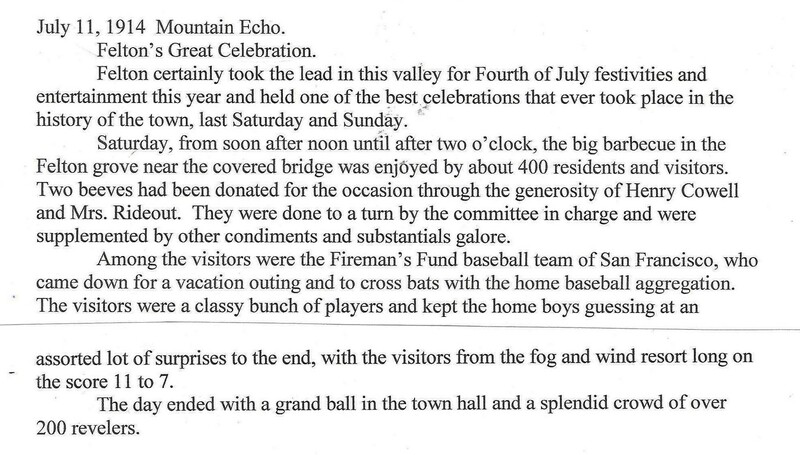 July 1914: Mrs. Rideout contributes to the 4th of July festivities at Felton Grove. 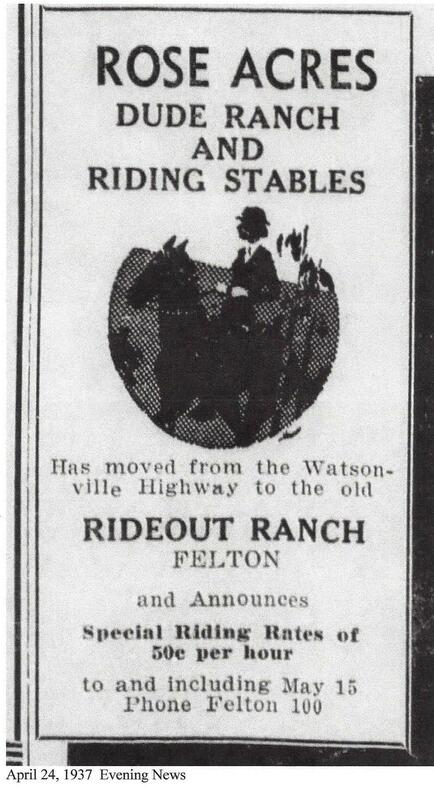 1937 Rideout Ranch ad Courtesy Randall Brown. 1906, 1907 Deeds and news briefs. Courtesy Randall Brown. 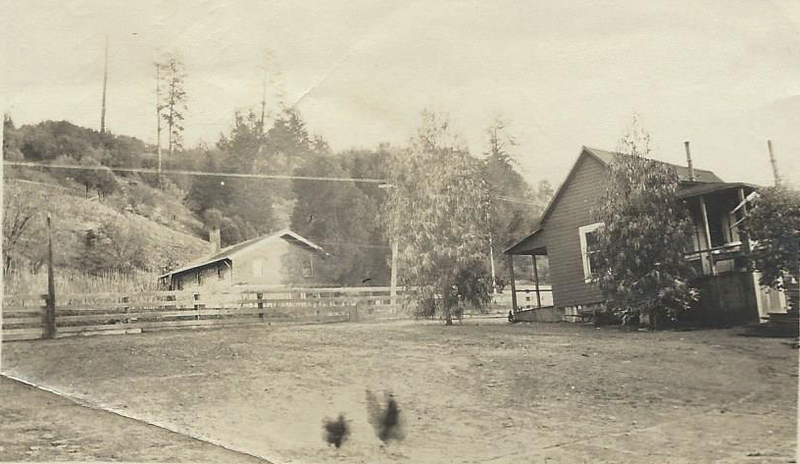 Photo of Rideout Ranch circa 1912. Courtesy of Carol Harrington. 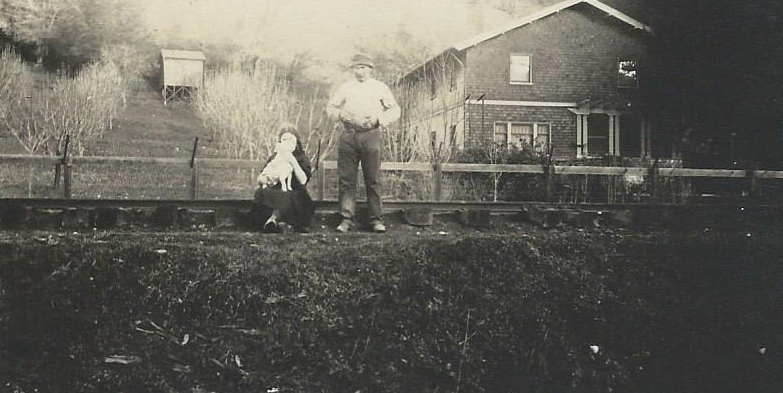 Note railroad tracks. 80 acre Rideout Estate between Felton and Brackney. Article 1937. 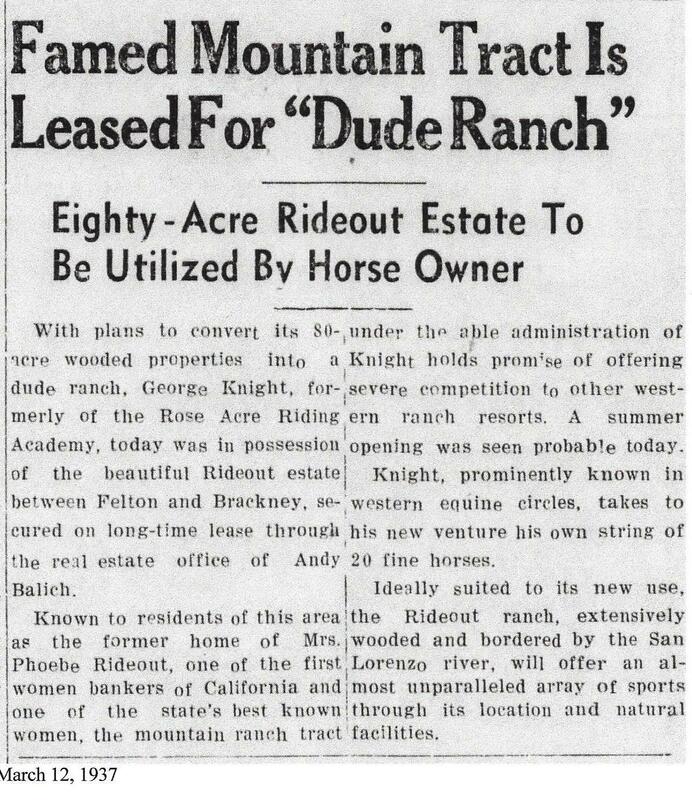 Circa 1912-13 Rideout Ranch photo. Courtesy Carol Harrington family collection. 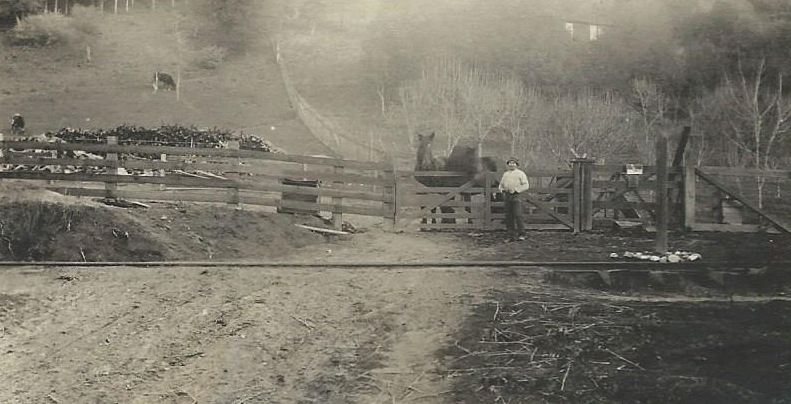 Circa 1912 Rideout Ranch photo courtesy of Carol Harrington. Check out the new comments on the original post. Lots of cool history of Heavenly Hamburgers! This wonderful photo was donated by Larry Worley, Lee’s son. 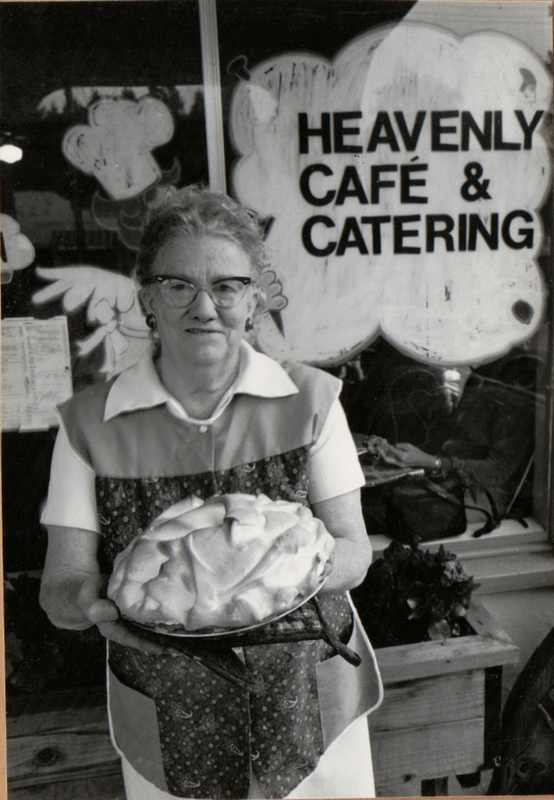 Lee Worley, Heavenly Cafe and Catering, Felton. 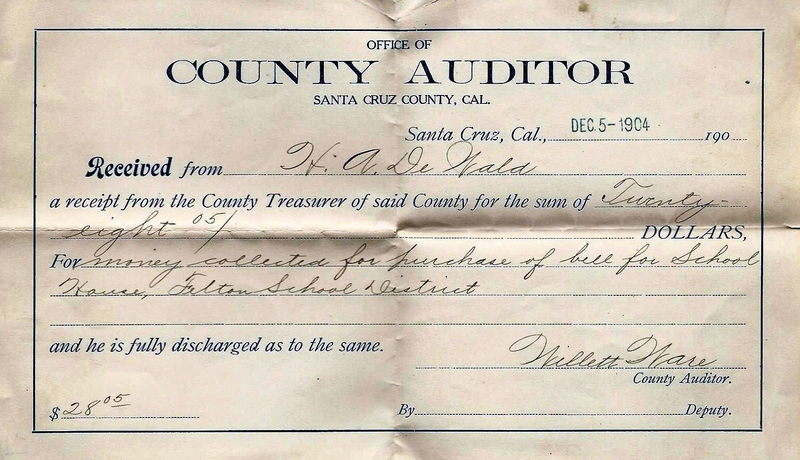 1904 receipt for Felton School bell, purchased by H. A. De Wald, long time Felton resident. Courtesy Carol Harrington. Derek Whaley Highway 9 has never officially been called Big Trees Highway. In fact, it hasn’t even been called Highway 9 for very long. 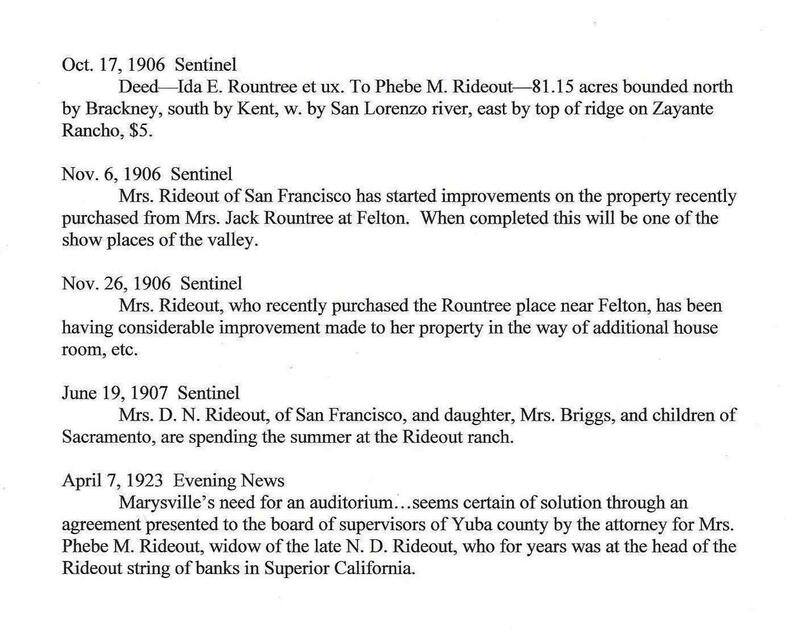 After it was bought by the county, it was either simply the “county road” or “San Lorenzo Drive”, which was split between “East San Lorenzo Drive” (now Graham Hill Road), and “West San Lorenzo Drive” (now Highway 9 between Felton and Santa Cruz). In Felton it was Baldwin Ave. In Boulder Creek, Main Street and, later, Central Ave. The road was only rerouted through Ben Lomond in the mid-1930s. I don’t know precisely when the highway was bought by the state, but it was originally a hodgepodge of local, county, and state roads that were all merged together and renamed Highway 9. Big Trees Highway was used by some marketers as a fanciful advertising gimmick, but it had no basis in official legal names. Could this be Felton Grove or was there a Sycamore Grove Resort Camp somewhere off Hwy 9 near Felton? 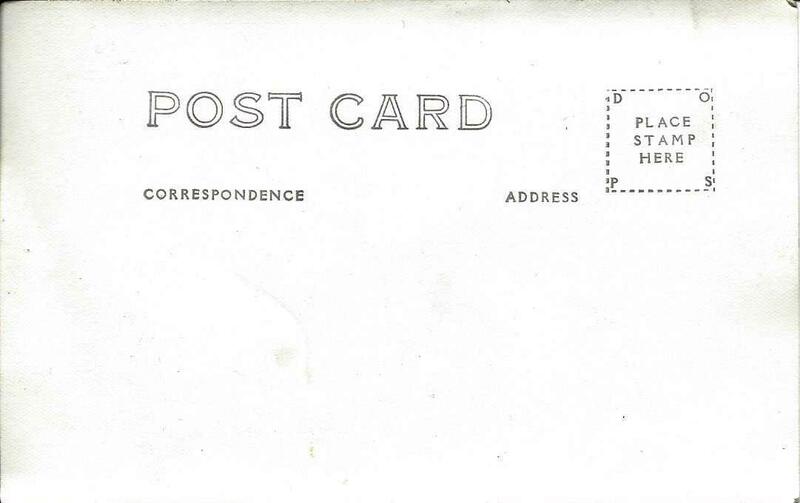 I’m including the front and back of this postcard with the hope that someone (Ronnie?) can also help me date the photo. Sycamore Grove Resort Camp postcard, front. Courtesy of Dan Selling. 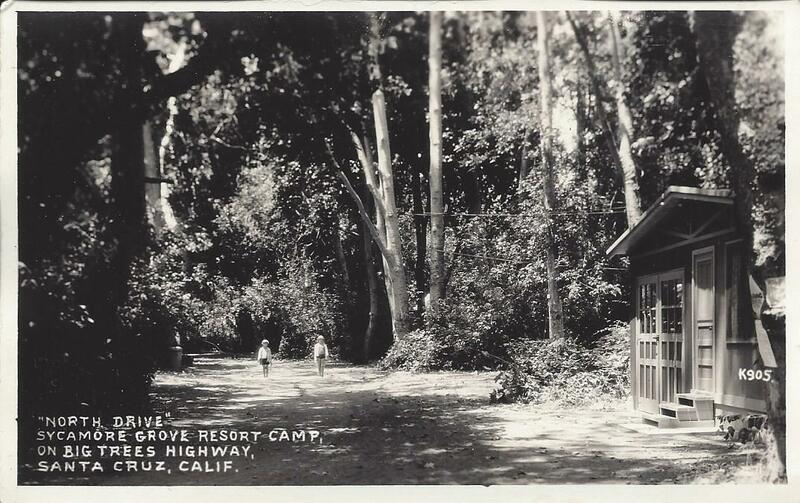 Back of Sycamore Grove Resort Camp postcard. 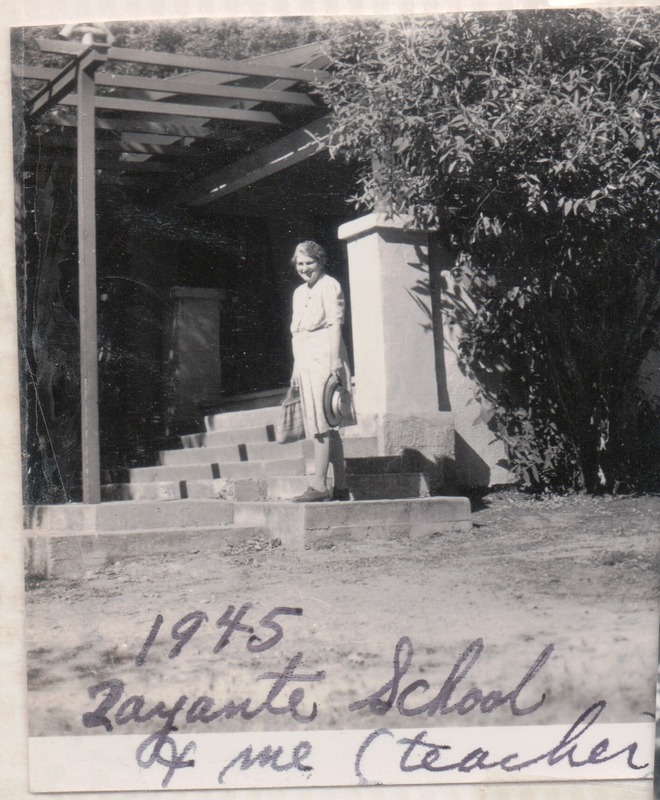 I also went to Zayante school, my name is Michael Barnhill (a.k.a.) Mickey. I was born in 1941. So think I started school in 1947. I rember the janitor’s house burned down, and him & his wife were killed. . Then we were bused to a new school in Felton. But then my sister Dale Barnhill And I left Zayante, Dad reinelsted in the Navy & and we lived Hunters Point Naval Station, waiting on a ship to take us to Hiwaii. We were there about a year. I built a raft,cause I was getting bored waiting for the ship.As I was about to launch my sturdy vessel , I said goodby to family and friends. Told them I would meet them in Pearl Harbor, when they arrived.Needless to say they confiscated my Viking ship, made of an old door and some logs that washed ashore tightly cinched together with some Rotten Rope I found on the beach. They broke up my mighty vessel & sent the parts adrift. 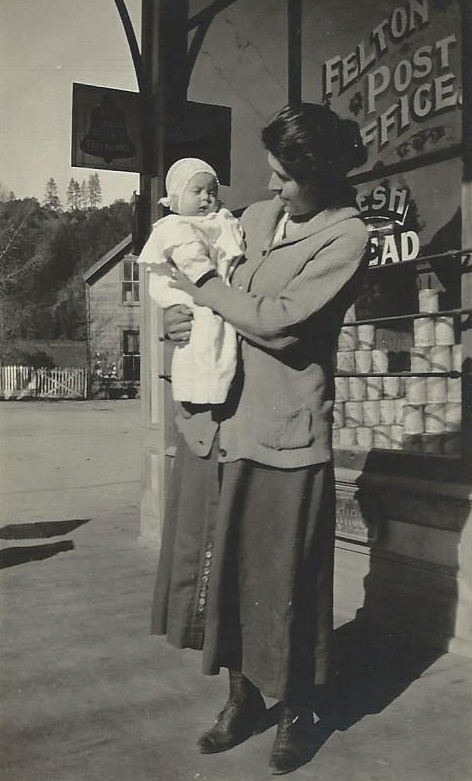 Marjorie Wright, Zayante School 1945. Courtesy of Patsy Wright Collection.